CRAZY COOL GROOVY!!! : CARLOS SANTANA, FRANCISCO LINDOR, & CARLOS CARRASCO On ESPN MAG!!! CARLOS SANTANA, FRANCISCO LINDOR, & CARLOS CARRASCO On ESPN MAG!!! 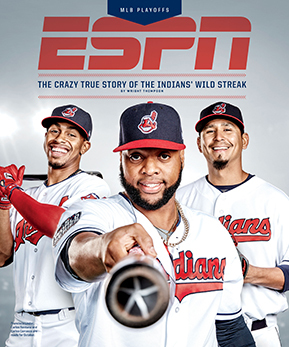 First Baseman CARLOS SANTANA, Shortstop FRANCISCO LINDOR, and pitcher CAR;OS CARRASCO and the CLEVELAND INDIANS reflect upon their MLB record-setting 22-game win streak and more as they cover the 2017 MLB PLAYOFFS PREVIEW issue of ESPN The MAGAZINE!!! The TRUMP PRESIDENCY On The ATLANTIC MAG!!! DONALD TRUMP vs The NFL On TIME MAG!!! GOOGLE CELEBRATES TURNING 19 YEARS OLD!!! I LOVE 2 EAT #172 - THE TROLLEY STOP CAFE!!! IS The NBA BECOMING MORE POPULAR THAN The NFL??? MITCH LANDRIEU On CBS THIS MORNING!!! TWITTER SOUNDS OFF - #IfRAPWasHIGHSCHOOL!!! WHY HAS The 2017 MLB HOME RUN PACE SKYROCKETED??? I LOVE 2 EAT #171 - PANERA BREAD!!! KAREEM ADBUL-JABBAR On AL SHARPTON!!! FRENCH MONTANA On VIBE MAG!!! AARON RODGERS On 2017 NFL PREVIEW For ESPN MAG!!! HUNTER McGRADY On CURVA MAG!!! 2017 EMMY AWARDS - FULL LIST Of WINNERS!!! RONREACO LEE On ROLLING OUT MAG!!! SAM DARNOLD On ESPN MAG!!! MOVIE TRAILER - CROWN HEIGHTS!!! DJ DRAMA On ROLLING OUT MAG!! !